An advocate for sustainability and the Louisville, Kentucky community, chef and owner Annie Pettry has become a leader in the renaissance of Louisville’s culinary scene, proudly supporting and uplifting fellow chefs, and nurturing diners at her warm soulful restaurant, Decca. 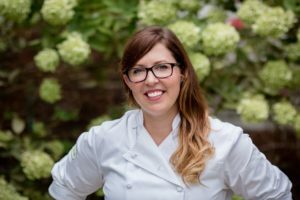 With a nuanced palate and a penchant for accenting dishes with creative spice blends, Pettry is known for her vegetable-forward dishes, Appalachian techniques and wood-fired cooking. She was raised in Asheville, N.C., with a childhood steeped in influential food experiences including growing vegetables, foraging for mushrooms, trout fishing and countless hours in the kitchen learning from her parents’ global cooking style. A Top Chef season 14 contestant and two-time Food & Wine “People’s Best New Chef” nominee, Pettry was the 2018 Louisville local all-star chef for James Beard Foundation’s Taste America, one of Restaurant Hospitality’s “15 To Watch in 2015,” a 2014 Star Chefs Rising Star, and the winner of the 2013 Louisville Cochon 555 Heritage BBQ competition. Her cuisine has been featured by several national food magazines including Food & Wine, SAVEUR and Bon Appetit to name a few; and her restaurant was given a four-star review by the Courier Journal. Pettry often steps out of the kitchen to work with charities related to her passions for food and cooking, including No Kid Hungry and The Food Literacy Project. She is also an alumna of the James Beard Foundation’s Chefs Boot Camp for Policy and Change, as well as a leader in the foundation’s national Smart Catch program, which aims to promote responsibly and sustainably sourced seafood.